The National Inland Waterways Authority (NIWA) and the Lagos State Government have pledged to work together to ensure a peaceful resolution of the lingering face-off over the control of the waterways in the state. 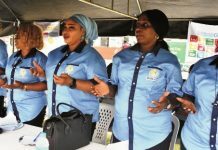 Governor Akinwunmi Ambode of Lagos State has directed all heads of agencies concerned to begin deliberations with NIWA to find a lasting solution to the challenges. Speaking during a courtesy call on the Lagos State Governor, the Managing Director of NIWA Senator Olorunnimbe Mamora stated that the need to avoid multiple taxation for waterways users brought about the courtesy call. Mamora in a statement made availasle to The Tide said, “We want operators to ply their trade without hindrance. We want to protect the interest of the waterways users and the interest of the operators, and by so doing, we want to ensure they are not unduly subjected to multiple taxation or multiple levies. “That is why there has to be this synergy, understanding and this collaboration so that in the area of possible conflicts, it will be easily managed without escalations of such conflicts. “We want to be sure there are safer water transportations. We want to be sure that waterways users comply with what we call waterways transportation code, whether in terms of avoiding overloading, use of lifejacket, night navigation, and avoiding over speeding “. ”These are some of the things.We also want to smoothen the rough hedges in terms of relationship between the Lagos state and federal government. “We will look at all ways that will make us achieve amicable resolutions of the disagreement between us and Lagos State. “There will always be conflicts. The conflicts will always be there. Even at home, we have conflicts. It is just as a result of misunderstanding or misinterpretation of the laws. Earlier in his iwelcome address, Governor Ambode lauded the gesture of NIWA MD, and directed concerned State agencies to begin deliberations with NIWA. “When the Federal Government appointed Sen. Mamora as NIWA MD, we knew the brotherhood between us will lead to peaceful resolution of the lingering dispute. “I have directed all heads of concerned agencies in this State to begin deliberations with the NIWA management,” Ambode said.